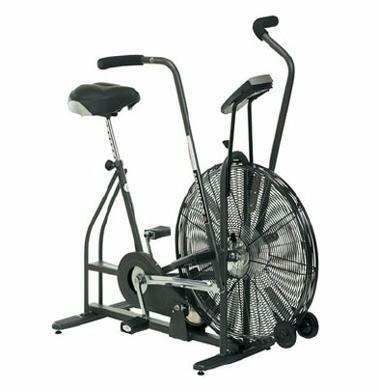 A Daily Dose of Fit: "What stationary bike should I use?" When I'm working at the gym, if I'm not training someone, I can usually be found watching over the fitness floor. I keep an eye on everyone's form, pick up weights when people get lazy and answer questions about the equipment. One question I get quite frequently: "What stationary bike should I use?" There are, after all, at least three available options. Plus spin bikes, but we reserve those for spin classes. A bike is a bike is a bike, right? Well, not necessarily—proven by the fact that so many people get confused as to which one is the best one for them. To help alleviate some of the confusion, I thought I'd discuss each of the four different stationary bike styles in today's post. NOTE: I pulled the following photos from Google Images simply to illustrate the specific bike style I'm speaking of. Please note that I'm not endorsing any brand shown, and that every brand features slight variations. Rest assured, the functionality of each style is generally pretty similar from one to the next. That said, let's begin with a dual-action stationary bike. This is a great option for people who want to work the entire body in one fell swoop because the arms move. And despite the fact that many of these bikes are outfitted with computers, your pedaling usually controls the difficulty because the front "wheel" is a fan. So the faster you pedal, the harder it will be to pedal because of all the wind resistance you create. Going back to the computer for a second, if it's there, it usually just records your time, calories and distance. Less to fuss with, really. Just hop on and pedal your little heart out. 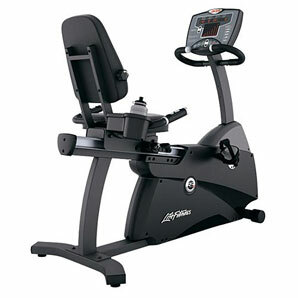 Upright stationary bikes are quite similar to the dual-action bikes, though slightly fancier. And, of course, your arms stay firmly planted on the handlebars in front of you as the lower half of your body does most of the work. The computers on these bikes also play a bigger role. If you forgo the "Quick Start" button, there are usually pre-programmed cycles that take you through intervals and hills. And a button, rather than your cycling speed, will adjust the intensity. If a spin bike isn't available, I usually go for these bikes because they feel the most like a real bike. But, of course, nothing says "real bike" quite like a spin bike. They generally don't have computers, just a knob that lets you control the resistance. Kind of like the gears on a 10-speed. And the handlebars are positioned in line with the seat. Unlike the previous two bikes, you'll have to lean forward race-style instead of sitting upright. This makes it more intense, and you'll get more of a core/shoulder workout. 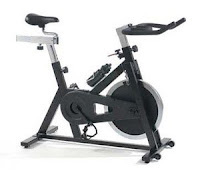 And speaking of leaning, some spin bikes lean to the side in an effort to mimic real road turns and curves. I've yet to ride a spin bike that has this feature, but I imagine it would up the ante of an already challenging piece of cardio equipment. Last up, the recumbent bike. 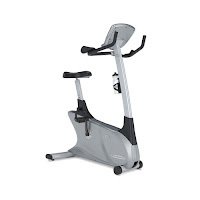 If you have back issues to begin with, or if staying upright/leaning forward puts unnecessary strain on your back, this may be the option for you as it provides a more comfortable perch for pedaling. And also, a perch that's easier to balance on. Yes, you'll be able to relax, but you'll feel your abs working a little bit harder than you might initially think. And, of course, the pedaling is still a great challenge. Ultimately, you have to decide for yourself which stationary bike is right for you. Try them all before you pick a favorite. Remember to adjust the seat correctly. There should be a slight bend in the knee when the pedal is furthest away from you, and the seat should be positioned so that your back and arms aren't straining to reach the handlebars. Proper form is essential, as it always is. Once you've tested them all, or if you're already riding a stationary bike, do tell me which one is your favorite! Ah, but there are computers that go with spin bikes now. There are watts meters to measure the power being exerted on the fly wheel. Bikes also come equipped with HR monitors as well as RPM and Cadence trackers. You can even set the incline so the resistance matches. Unfortunately a bike like this sells for upwards of $3,000....NO JOKE! As for the bike that simulates real turns? I will respond as an avid outdoor road cyclist. The strength required to "make a turn" on the indoor version leaves me scratching my head! I have never had to work that hard to make a turn, (it does require balance, control and centering from ones core). Makes me wonder just how many pulled lower back muscles the industry would begin logging if everyone went to this type of a bike?